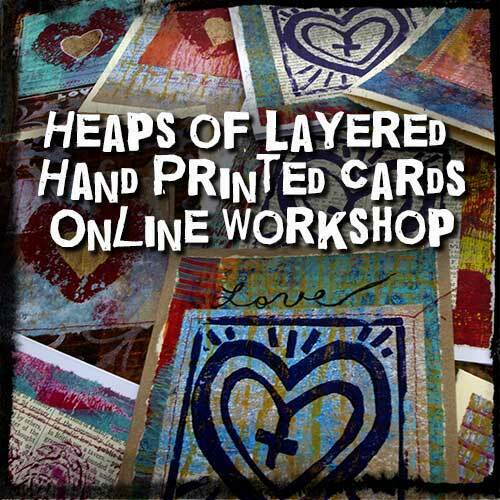 This is much more than just a card making workshop! Along with some printing techniques, you’ll learn how to make several stamps including a background stamp, as well as how to make your own envelopes. And of course, through my fun process you’ll end up with heaps of layered cards, that are all unique without making each one separately, using your handmade printing and stamping tools. The workshop is presented through 9 videos, totaling about 90 minutes. To pack in as much as I could as quickly as possible, the videos of me working are time lapse that I edited with voice-overs, explaining what I’m doing as I’m doing it. It’s the next best thing to taking a live workshop with me. And this way you can do it whenever you want, no matter what time it is, without having to leave your house. Pajamas and bed-head are not a problem! 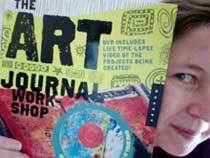 The workshop takes place in a members-only part of my web site. You can work at your own pace, and all of the lessons are already up, just waiting for you. Post any questions or comments you have on the lesson pages and I’ll be happy to answer you. There is also a private facebook group if you’d like to post any pictures of what you made, or want to connect with other workshop students. By signing up for the class, you’ll have access to the workshop through my site for lifetime* (AKA a crazy long time). That means you can watch the videos for the workshop through my site whenever you want, but you can’t download or save them. You also get several downloadable pdfs with information for the class: one is a materials list with it also broken down into what you need for each lesson, and the other two are envelope templates that I designed for the workshop. Since this is instant access, there are no refunds once you sign up. Be sure you have adequate internet access for streaming the videos before signing up. Please e-mail me if you have any questions or concerns before signing up. *Lifetime is a long time and sh!t happens. So in this case, I have to say that forever means barring any unforeseen circumstances, and as long as I have my website running, or have a suitable place online to move the workshop to. I’ve had my site for many years, and don’t see it disappearing any time soon. So let’s just say, you’ll have access for a crazy long time. I accept Visa, MasterCard, American Express, Discover & PayPal. 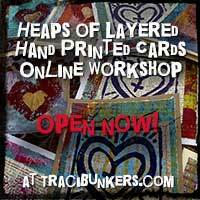 Note: My online workshops use a different login than my shop. A new workshop login will need to be set up below.